Yesterday night a tragic accident occurred in the outskirts of Santiago de Compostela (Spain) when an AVE (Alta Velocidad Española, equivalent to the french TGV) derailed while in a pronounced curve. Many people were killed (latest reports talk about 65 people) and many more were injured. The driver, while trapped in the cockpit, talked in the radio with the managing post and said that he was going at 190Km/h (approx. 120mph). Authorities have still to analyze the data in the black box to certify what the speed was and what where the causes of such accident. While we should wait for the forensic analysis to find about the exact speed and the causes of this tragic event, I measured, with some simple reasoning, that the actual speed should be around 150 Km/h. This is still much higher that than the speed limit (80 Km/h) set for this area. Here is how I came up with the approximated speed. We can see that far back in the image there is a big highway, and that the camera is placed right after a bridge crossing the railroad, being this bridge the first one found after the highway, once the curve started. This corresponds perfectly to the image we can see from google maps or google earth. Note that I found this location by matching the description given by media and looking at the major landmarks seen in the video above, so it might not be correct after all. In google maps we can see that if we place a camera right after the first bridge and look towards the highway in the far back, whenever we start seeing the train coming it should be approximately underneath the highway. Considering this approximate hypothesis, I computed in google earth the distance between the bridge and the highway as the approximate distance that the train will run while being filmed by the camera. As it can be seen in the image below, this distance is approx. 239 meters. Next, I downloaded the video of the crash and played it in very slow motion. I saw that the video is in real time (the cars in the back might seem a bit slow, but this is an optic effect due to the cars being about 250m from the observer). Still, I decided to rely instead on the time that appears in the bottom-right of the image to measure how long it takes the train to run the 239 meters that separate the point when the train appears in sight and when the train crosses the bridge. 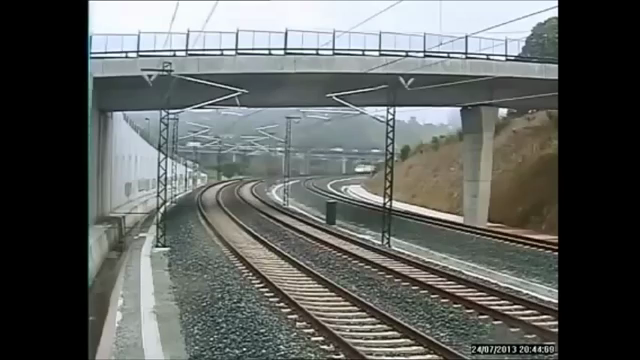 After playing the video in very slow motion several times I estimate that the train appears at 20:43:59,689 and crosses the bridge at 20:44:05,714. The two images below show the approximate snapshots when the train starts appearing and when I consider it passes under the bridge. Given that distances are approximate (as well as everything else) we will say that the train takes approximately 6 seconds to go from the highway to the first bridge. With these informations we have everything we need to compute the speed of the train, which is speed = 239(m) * 3600(s/h)/(6(s) * 1000(m/Km)) = 143 Km/h. Some might say that the train significantly slowed down after it started derailing and was sliding down the railroad towards the bridge. To take this into account I took another (very inexact) measure by considering that the train started to derail right when the side wall starts, and did again the computation. The number now accounts for approx. 4.6 seconds to travel 187 meters, which means a speed of approx. 146 Km/h. Both these speeds are far from the 190 Km/h that the driver claims, but much higher than the maximum for that area of the railroad system, considered a very dangerous one. This, in my opinion, would explain the fact that the train derailed and thus the accident. 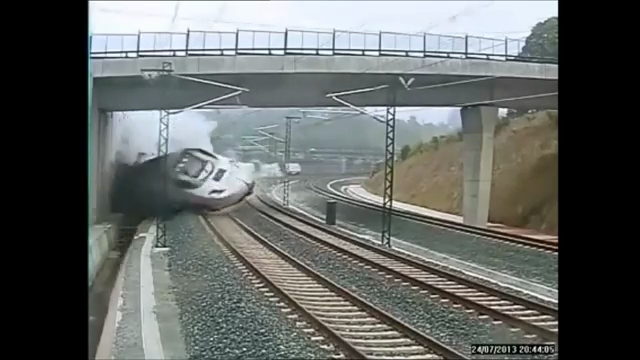 Finally, it is possible to think that the driver started applying the brakes right after crossing the highway and getting into the curve, but the train could not stop soon enough. This would explain why the driver claims he was going at 190Km/h while the measurements while applying the brakes account for less. In conclusion, we will have to wait for the forensic analysis to find out.